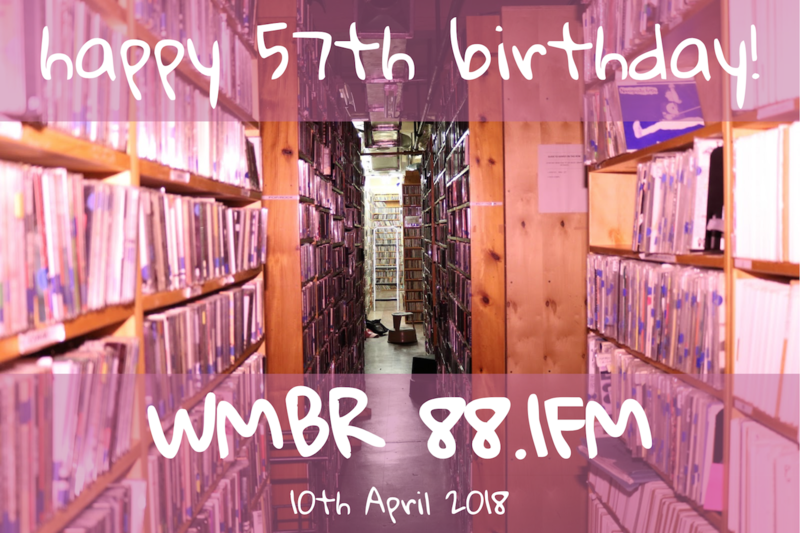 Celebrating 57 Years of WMBR! On the 10th of April in 1961, a tiny radio station with call letters WTBS signed on the air for the first time from the campus of MIT, with a 10-watt FM signal at 88.1 MHz. 57 years later, that station is now called WMBR, broadcasting with a 720-watt signal and entirely supported by volunteers and listeners. We’re incredibly grateful to have had the support of so many wonderful people throughout all these years. Thanks for sticking around and supporting our college radio shenanigans! This post details a bit of WMBR history for anyone interested in reading about WMBR’s humble beginnings. Photo by Karina, host of Mare Nubium. We’re thrilled to be moving into our Summer 2017 Programming Season, welcoming in a bunch of new and returning shows along with the sunny weather! You can see our schedule (with more info about alternating shows) at this link, and our soon-to-be-published full program guide at this link. We have 15 new shows joining our schedule! We also have several other shows returning after a hiatus of one or more seasons – welcome back, Vegan Soulfood and Entrepeneurs of the World, Unite! We were able to schedule every internal show proposal that we received this season – an exciting time for the programming board. As always, you can listen along at wmbr.org or 88.1FM. Fall 2014 Season Starts TODAY! 1. 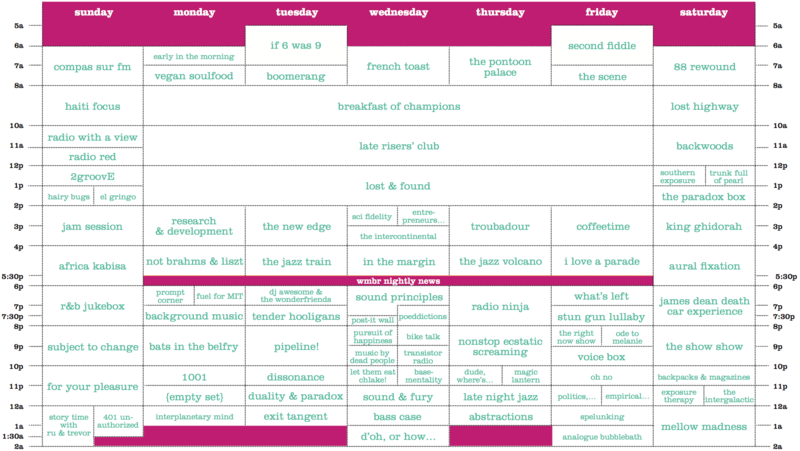 NEW WMBR SCHEDULE with toooons of new shows from our newest ‘MBR members! We are all sad that Backwoods will not be returning for the Fall Season, but John Funke has promised us an equally great, name-to-be-determined, hour-long show Saturdays at 11AM. And did I mention the plethora of new shows on air this season?! Programming guides will be coming out shortly with more information on DJs and show content. Don’t forget, you can always email guide@wmbr.org with your full mailing address if you’d like a guide sent to your home. Until next time… tune in to 88.1 FM or online at wmbr.org! As a participating station, we at WMBR have decided to bring you a full day (well, a full 20 hour day) of radio programming featuring a large variety of unsigned, independent, and local artists. So really, we’re doing the same thing we always do. Discover more college radio stations in your area here.